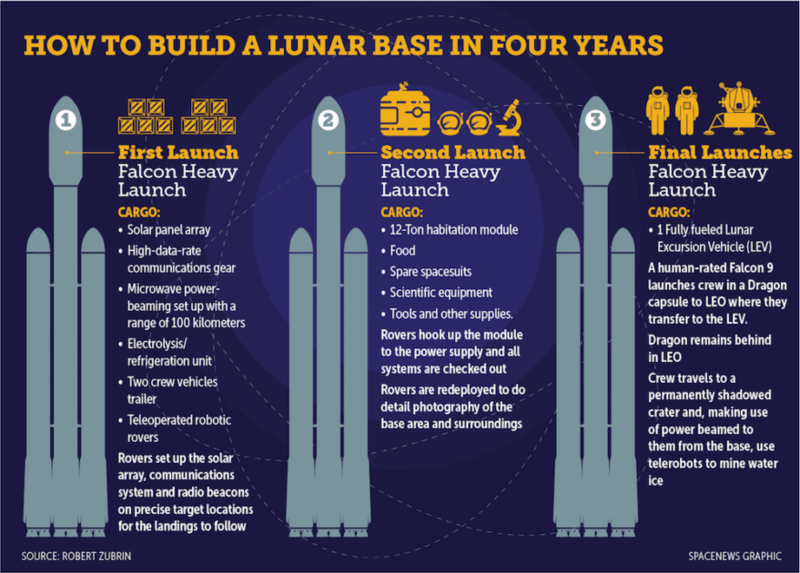 I recently came across an op-ed on how we could establish a moon base in four years and thought it worth sharing, especially in light of my increasing annoyance with our government’s plan for a Lunar Orbital-Platform Gateway. A dreadful acronym that. The gateway is a space habitat set in a near-rectilinear halo orbit. My question is why? Why go to all that trouble for another fragile station instead of building a base on the moon? 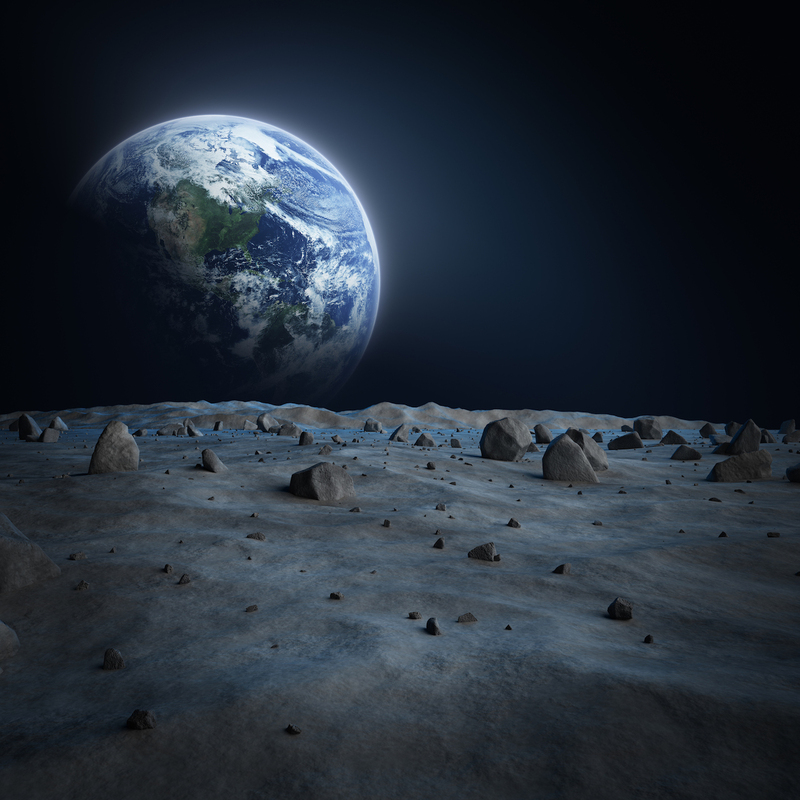 A lunar base would have unlimited growth potential and an abundance of resources, including the potential for long-term radiation-shielded habitat under the moon’s surface. There is a good possibility we could use existing lava tubes as a base. A base that would provide radiation shielding and possibly even water. Or perhaps Mr. Musk will send up a boring machine or two…squirrel! (For an amusing take on Elon, check out Elon Musk is Rocket Man). Come to think of it, I’m surprised Trump didn’t insist on a lunar base. US makes first lunar camp, Trumpville! Ok, we don’t need to go there. A sustainable lunar base is going to take years to develop. I hate the thought of delaying it further. I take heart in the idea that if we don’t do it, some other country will. Below is a fairly detailed plan on how we could establish the beginning of such a base in four years. It’s written by Dr. Robert Zubrin, a man whose intelligence and passion for space exploration I deeply respect. He sums up my opinion really well in the last paragraph. I’ve reposted with Dr. Zubrin’s permission. The recent amazing success of the Falcon Heavy launch offers America an unprecedented opportunity to break the stagnation that has afflicted its human spaceflight program for decades. In short, the moon is now within reach. Here’s how the mission plan could work. The Falcon Heavy can lift 60 tons to low Earth orbit (LEO). Starting from that point, a hydrogen/oxygen rocket-propelled cargo lander could deliver 12 tons of payload to the lunar surface. We therefore proceed by sending two such landers to our planned base location. The best place for it would be at one of the poles, because there are spots at both lunar poles where sunlight is accessible all the time, as well as permanently shadowed craters nearby where water ice has accumulated. Such ice could be electrolyzed to make hydrogen-oxygen rocket propellant, to fuel both Earth-return vehicles as well as flying rocket vehicles that would provide the lunar base’s crew with exploratory access to most of the rest of the moon. The first cargo lander carries a load of equipment, including a solar panel array, high-data-rate communications gear, a microwave power-beaming set up with a range of 100 kilometers, an electrolysis/refrigeration unit, two crew vehicles, a trailer, and a group of tele-operated robotic rovers. After landing, some of the rovers are used to set up the solar array and communications system, while others are used to scout out the landing area in detail, putting down radio beacons on the precise target locations for the landings to follow. The second cargo lander brings out a 12-ton habitation module, loaded with food, spare spacesuits, scientific equipment, tools, and other supplies. This will serve as the astronauts’ house, laboratory, and workshop of the moon. Once it has landed, the rovers hook it up to the power supply and all systems are checked out. This done, the rovers are redeployed to do detailed photography of the base area and its surroundings. All this data is sent back to Earth, to aid mission planners and the science and engineering support teams, and ultimately forming the basis of a virtual reality program that will allow millions of members of the public to participate in the missions as well. The base now being operational, it is time to send the first crew. A Falcon Heavy is used to deliver another cargo lander to orbit, whose payload consists of a fully fueled Lunar Excursion Vehicle (LEV). This craft consists of a two-ton cabin like that used by the Apollo-era Lunar Excursion Module mounted on a one-ton hydrogen/oxygen propulsion system filled with nine tons of propellant, capable of delivering it from the lunar surface to Earth orbit. A human-rated Falcon 9 rocket then lifts the crew in a Dragon capsule to LEO where they transfer to the LEV. Then the cargo lander takes the LEV, with the crew aboard, to the moon, while the Dragon remains behind in LEO. After landing at the moon base, the crew completes any necessary set up operations and begins exploration. A key goal will be to travel to a permanently shadowed crater and, making use of power beamed to them from the base, use telerobots to mine water ice. Hauling this treasure back to the base in their trailer, the astronauts will feed the water into the electrolysis/refrigeration unit, which will transform it into liquid hydrogen and oxygen. These products will then be stored in the empty tanks of the cargo landers for future use — primarily as rocket propellant but also as a power supply for fuel cells and a copious source of life-support consumables. Having spent a couple of months initiating such operations and engaging in additional forms of resource prospecting and scientific exploration, the astronauts will enter the LEV, take off and return to Earth orbit. There they will be met by a Dragon — either the one that took them to orbit in the first place or another that has just been launched to lift the crew following them — which will serve as their reentry capsule for the final leg of the journey back home. Thus, each mission that follows will require just one $100 million Falcon Heavy launch and one $60 million Falcon 9 launch to accomplish. Once the base is well-established, there will be little reason not to extend surface stays to six months. Assuming that cost of the mission hardware will roughly equal the cost to launch it, we should be able to create and sustain a permanently occupied lunar base at an ongoing yearly cost of less than $700 million. This is less than four percent of NASA’s current budget — or about a quarter of what is being spent yearly on the agency’s now obsolete Space Launch System program which has been going on for over a decade without producing a rocket. The astronauts will not be limited to exploring the local region around the base. Refueled with hydrogen and oxygen, the same LEV spacecraft used to travel to the moon and back can be used to fly from the base to anywhere else on the moon, land, provide on-site housing for an exploration sortie crew, and then return them to the base. We won’t just be getting a local outpost: we’ll be getting complete global access to an entire world. Currently, NASA has no such plan. Instead it is proposing the build a lunar orbiting space station dubbed the Deep Space Gateway. This boondoggle will cost several tens of billions of dollars, at least, and serve no useful purpose whatsoever – except perhaps to provide a launch manifest for the Space Launch System. We do not need a lunar-orbiting station to go to the moon. We do not need such a station to go to Mars. We do not need it to go to near-Earth asteroids. We do not need it to go anywhere. If we do waste our time and money building it, we won’t go anywhere. If you want to get to the moon, you need to go to the moon. We now have it in our power to do so. Let’s seize the time. Robert Zubrin is president of Pioneer Astronautics and the Mars Society. An updated edition of his book, “The Case for Mars: The Plan to Settle the Red Planet and Why We Must,” was recently published by the Free Press. This entry was posted in TechNiCity and tagged Elon Musk, Falcon Heavy, Lunar Base, Moon Base, Robert Zubrin, SpaceX. Bookmark the permalink.